Asset Management Corporation of Nigeria (AMCON) has denied plans to nationalise Arik Air after its takeover by the Federal Government. The denial is contrary to claims making the rounds that the distressed airline and Aero Contractors are set to be merged, to become Nigeria’s new national carrier after the defunct Nigeria Airways. AMCON reiterated that Arik was captured from its erstwhile management to save the airline from imminent collapse and not for any ulterior motive as currently peddled. Recall that AMCON, a Federal Government-owned firm, last week took over management control of Arik. The largest carrier in West and Central Africa was alleged of bad corporate governance, erratic operational challenges, inability to pay staff salaries and heavy debt burden among others. While stakeholders have expressed mixed feelings about the development, the Association of Concerned Aviation Professionals (ACAP) raised an alarm over the intervention, accusing AMCON of pursuing a selfish agenda to foster the Federal Government’s desire to establish a national carrier through subterfuge. Nwokolo added: “How laughable that the same AMCON hired the erstwhile Deputy Managing Director of the same management it accused of ‘poor corporate governance’ as new CEO of Aero Contractors on the very day it forcibly took over the company. Who is fooling who? “The agenda is to bring together Arik Air and Aero to form what they call a new national carrier and bring in Ethiopian Airways as technical partner. What a shame! We bring a smaller country like Ethiopia to run a national carrier for Nigeria, the supposed Giant of Africa? If government could run an airline, Nigeria Airways would not have gone under,” he said. But in reaction, Head of Corporate Communications, Jude Nwauzor, said the claims were figments of some people’s imagination, as the aim of AMCON’s intervention was to save the airline from collapse and normalise it operations. Nwauzor added that the new management had started with receiving briefs from different departments, coupled with KPMG auditing the airline. Deputy Director, Press and Public Affairs, Aviation Ministry, James Odaudu, also explained that the government only intervened in Arik in order to save the carrier from collapse. He added that the Minister of State for Aviation, Hadi Sirika, had never given inkling to suggest that Arik will be converted to a national carrier. Odaudu said: “I have heard such claims too and they are just speculations. 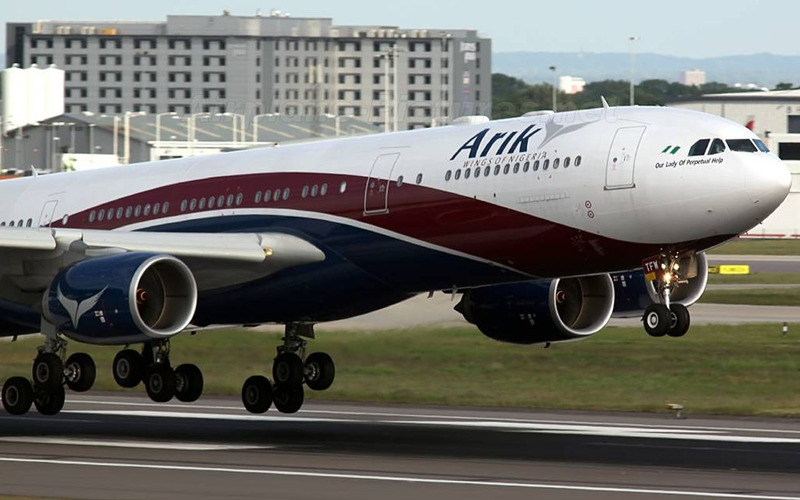 The Federal Government is not planning to convert Arik Air to a national carrier. I don’t have that information. Like the minister has always stated, the Federal Government will establish a private sector driven national carrier. “As far as I know, I don’t think the government will want to start a national carrier with an airline that is full of encumbrances like Arik Air. Why did AMCON take over Arik Air? It is because of the problems faced by the airline. “We’ve heard even senior officials of the airline saying that the Federal Government wants to take over Arik because it wants to establish a national carrier, but to the best of my knowledge that’s not true. The truth is that as far as government is concerned, the more healthy airlines we have in the country, the better for us as a nation,” he said. Just stop and think about this – for a couple of seconds: Arik Air has just been declared INSOLVENT (No money, in debt, little chance of improving their revenue stream…so they continue to lose money) – AND NOW…there is discussion regarding the government of Nigeria wanting to nationalize the company – SO THE TAXPAYERS OF NIGERIA CAN PAY FOR ALL THE SLOTH, DISHONESTY, INCOMPETENCE AND CORRUPTION. Perfect !! “…the government only intervened in Arik in order to save the carrier from collapse”. What is precluding the airline from collapse…today? Nothing changed at the airline company – EXCEPT – that Nigerian taxpayers are picking up the tab for 100% of the deficiencies which led to the takeover by AMCON. It’s good to know that the government is concerned and has the good of its citizens at heart. Our airlines in this country should indeed be more healthy. And It clearly doesn’t seem to me that there is an imminent collapse in the aviation sector, rather what I see here is a plan to make things right and better.